The strategy to charge a fine from the safai contractor has paid off. It has led to an increase in the monthly collection of biomedical waste at local Jallianwala Bagh Memorial (JBM) Civil Hospital here. Following a news report carried in these columns on November 17, the Jallianwala Bagh Memorial Civil Hospital authorities have decided to go for fresh installation of water taps and pipes. The slow pace of construction of road from Gwal Mandi Chownk to Army cantonment has angered local residents. Residents find commuting really hard on this under-construction road. Irked residents complained that the work on road has not been expedited despite their repeated requests. The road under construction near Gwal Mandi in Amritsar. Photo: sameer sehgal. After the PWD raised the level of busy Majitha road by "two feet", hundreds of shopkeepers have come out against the move. Dry fruit importers of the holy city have got a reason to cheer. The customs duty over the import of dry fruits from Afghanistan has been abolished. The three-day all-India sports, music and educational competitions for visually impaired children, organised by the Association for Welfare of the Visually Impaired Employees of Punjab, commenced on the campus of Guru Nanak Dev University here today. The junior doctors at Government Medical College will decide about the future course of their agitation tomorrow. A Class VI student of DAV International School, Kashish, won the first position and received the cash prize of Rs 10,000 in a state-level painting competition held at Panchkula on November 14. The Punjab State Power Corporation (Power Corp) organised a declamation contest for school students at Baba Karan Das Public High School, Jagdev Khurd, near here today. An analysis of the biomedical waste collection data of the past five months has recorded a nine-fold increase. In the month of June, the hospital had collected only 150 kg of biomedical waste from all its OPDs (out patient departments), patients' wards and theaters. Due to a strict vigil over the collection and segregation process, the total collection increased to 1,376 kg, an over nine times increase, in October. As per data, the collection in July stood at 179 kg which rose to 379 kg in August. The collection witnessed a steep rise during September; the same month the hospital management charged a fine of Rs 5,000 from the safai contractor appointed by Punjab Health Systems Corporation. In September, the collection rose to 1,306 kg as against the 379 kg collected in the previous month. Talking to Amritsar Tribune, Senior Medical Officer (SMO) Dr Balbir Singh Dhillon said, "As per provisions of the contract between the contractor and Health Systems Corporation, the hospital management can deduct Rs 1,000 on daily basis, for deficiency in service, from the amount paid to the contractor for services rendered to the hospital." He said the strategy to fine the contractor has paid off. It has made him accountable. In return he asks his employees to work better. The SMO admitted that there had been lapses in the proper collection and segregation of the biomedical waste. Dhillon said, "At the first stage we checked all the segregation points and made those responsible for the segregation accountable for the lapses. Then it was found that those responsible for the collection were not doing their duty properly." 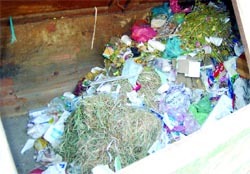 The hospital also had to change its biomedical waste store in order to check the stealing of the waste, mostly plastic. "It was found that people, especially rag-pickers and few safai sewaks, were indulging in stealing the medical waste and selling it in market. The empty syringes and injections made of plastic and glass were re-sold in the market," he added. As per an estimate, a 150-bed hospital is expected to generate 1.5 kg of biomedical waste per day depending on the number of patients admitted at the hospital at any particular point of time. Earlier, Amritsar Tribune had reported that patients and their attendants at the gynaecology ward of the Jallianwala Bagh Memorial Civil Hospital are being deprived of the basic sanitation facilities as the doors of the gynaecology ward here are locked. To access washrooms, they are forced to go to the washrooms in the corridors of the hospital building. The hospital management is, however, indifferent in this regard. The condition of the washrooms for men is not different. The ward has washbasins without taps leading to wastage of water. 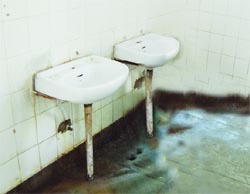 The hospital authorities have instead placed buckets under the running taps. Meanwhile, at the same time the authorities today expressed their helplessness to curb the rising incidents of theft of sanitary equipment from washrooms. Within two months of the hospital getting all the missing taps fixed, burglars had removed the equipment from many washrooms. The metal wall angles, pipes and other fittings too have been stolen. This time, to make the task difficult for thieves, the management has planned to use push button water taps instead of the earlier installed taps which are rotated to release water. A blessing in disguise the push taps would also help save water. Talking to Amritsar Tribune, Senior Medical Officer (SMO) Dr Balbir Singh Dhillon said, "After a thorough discussion on the issue we have decided to use push button water taps as these would be a little harder to steal them." The rotating taps which are fixed on the washbasins can be removed with the help of bare hands only, he said. The hospital had spent Rs 31,000 to get the taps fixed around two months ago. Facing it difficult to guard the washrooms against these thieves, the hospital's decision to use push taps would cut costs on using wall angles and pipes. "But the push taps cannot be fitted on the washbasins directly. These would be fitted on the wall above the basin with just a little pipe intruding out of the wall," said the SMO adding that there is no other option. He added that spending Rs 30,000 every two months for the same job is impossible. Deputy Medical Commissioner Dr Hardeep Singh Ghai, who visited the washrooms to asses the loss, said, "Drug addicts steal these items as they are in dire need to arrange money for their daily dose." He said though the hospital has ample security to guard the premises, but it is impossible to keep an eye over each washroom. It is estimated that the hospital is visited by more than 3,000 patients and their relatives every day. It becomes very difficult to distinguish thieves from this large crowd. Ghai also requested the general public to report any person stealing the equipment to the hospital staff. The slow pace of construction of road from Gwal Mandi Chownk to Army cantonment has angered local residents. Residents find commuting really hard on this under-construction road. 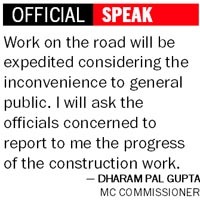 Irked residents complained that the work on road has not been expedited despite their repeated requests. Residents said the roadwork had started around three months ago and in normal circumstances it is enough time to cement a small stretch of road. At present the workers are still busing making the soil layer, which is used as foundation for construction of road. A shopkeeper in the area, Amanpreet Singh said, "In these three months, the authorities concerned have not been able to complete even the preliminary work. The stretch that is under construction is hardy 200 yards." He added that perhaps the road is not on the priority list of the MC as no political bigwig commute on this road. The heavy dust on the road poses a problem for commuters. Ram Kumar, a resident, said, "There is so much dust on the road because of the vehicles commuting all day which worsens the situation." He added that if the authorities are to do the work at snail's pace at least they should sprinkle water on the road to find an end to the problem of dust. Residents revealed the said stretch of road had been a bone of contention between the Municipal Corporation and the Army Cantonment board. A school teacher, Kewal Kishan said, "Because of the controversy, the road was not repaired for a long time even though it had developed potholes around five years ago." Their point is that the shops, located on a low level, would bear the brunt of the heightened road. 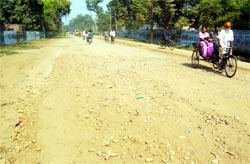 A shopkeeper, Ravinder Kumar, said the height of road bed had been raised against the norms. He said if it rains these shops, set up decades ago on the road, would be inundated causing loss to material and merchandise. Another shopkeeper, Jagpal Lalli, said it was one of the busiest roads of the city and densely populated localities were situated on either side of the road. Besides, Guru Nanak Dev Hospital, a number of private hospitals, Sacred Heart School for Girls, polytechnic college for women and a high number of private educational institutes were located in the area. Another trader Rajinder Kumar wondered that a large portion of the road, which was in fine condition, had again been re-laid. He said that their repeated requests to the department for reconsidering the height of the road fell on deaf ears. He said they were given a terse remark that it was a departmental work and they need not interfere. He said for many shopkeepers it was a sole source of earning and they did not have cushion to bear the losses due to an avoidable reason. He said many shops were one foot to two feet down from the road level. Thus, it was an open invitation to rain water to enter shops. 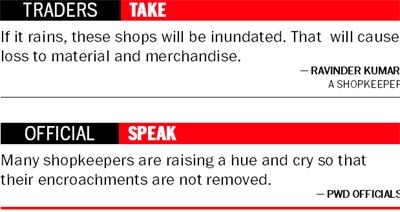 Meanwhile, PWD officials said many shopkeepers were raising a hue and cry so that their encroachments should not be removed. PWD Executive Engineer Sukhdev Singh said the project of carpeting the 2.45 km stretch of Majitha road was initiated in August after due consultations with experts. He said there was no need to fear for drainage of water as adequate rain water disposal would be constructed. He said the height of road had been raised by about 1.25 feet. He said footpaths, to be constructed, would prevent rain water to enter shops. Importers said abolition of customs duty would increase their business manifold. The city-based Indo Forum Chamber of Commerce (IFCC) said the local dry fruit industry, which was once hub of the trade in the country, would benefit the most. IFCC president BK Bajaj said as of now, dry fruits worth Rs 1,000 crore were imported from Afghanistan annually. He added that it was a welcome move to abolish customs duty on all types of dry fruits being imported from Afghanistan as it would increase the volume of import. He said the orders came into effect a fortnight back. Customs officials consulted that the exact figure would be known at the end of this financial quarter. The import would at least rise by Rs 300 crore annually, Bajaj said. He said a kg of dry plum, which used to attract Rs 60 as customs duty, would go. Rs 30 would be waived off on a kg of apricot, Rs 40 on a kg of raisin, Rs 48 a kg on almond kernel and Rs 26 on a kg of almond. The traders would pass on the partial benefits to the customers. Price of a kg of almond kernel had come down from Rs 425 to Rs 385. It may be mentioned that the Central Government passed the orders under the SAFTA agreement last month. He said import of dry fruits from Afghanistan would cut down the overhead cost and make the local market competitive domestically. He said bulk of these items go to Delhi to be sold in the rest of the country. They also supply material to Haryana, Himachal Pradesh, Rajasthan, Uttar Pradesh, Madhya Pradesh and others directly. 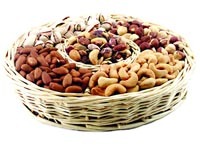 Dry fruit merchant Rajesh Arora said the local dry fruits market may overcome the competition from markets in Jammu and Kashmir. He said following bilateral agreement between India and Pakistan, certain routes in the hilly state were allowed duty free trade under a barter system. He said it spelled negative for the age-old Amritsar market as it was procuring the same material after paying the duty. More than 550 visually impaired children from eight states and two union territories are participating in the competitions. President of the organising committee HS Bajaj said the sports competitions were being held in indoor and outdoor activities. Students from more than 25 schools for visually impaired children were participating in the competitions. The participants had been constituted into two categories on the basis of their age. The under-14 students were competing in the junior category and under-21 students in the senior category. Bajaj said the association had decided to hold the competitions in view of the lesser avenues of the kind available for visually impaired. On the first day, competitions in 100-m race, shot put, declamation, chess and music were held. Inaugurating the competitions, Chief Parliamentary Secretary Seetal Singh said the state government had initiated a number of schemes for the welfare of the visually impaired. In a meeting with senior state officials today, the representatives of the local Junior Resident Doctors Association (JRDA) were assured of increase in their monthly stipend to Rs 35,000 per month. The doctors are presently getting Rs 22,000 per month. The doctors had also been protesting against the irregular manner in which salaries are paid to them. The junior doctors had struck work at various hospitals of the Government Medical College in protest against the state government last week. Later, they had resumed work as the Chief Minister invited them for a meeting in Chandigarh. The Bhakhra Beas Managing Board, Chandigarh, had organised the competition under the save electricity campaign. The school principal, Anjana Gupta, congratulated the young achiever. Four kayaks of the BBK DAV College for Women represented the GND University kayaking team in the all-India inter-varsity championship, which concluded at Pong Dam, Talwara, on November 16. College kayaks won seven silver medals. Pekter Karlo won four silver medals, Maninder and Savita won a silver medal each in the K4 1000 event. Senior Executive Engineer, Power Corp, said the aim of the declamation contest for students of various schools was to make them aware of the ways and need of power conservation. Kamanjit Kaur of Baba Karan Das School was adjourned the best speaker. Shamsher Singh from Government Secondary School, Balarwal, and Amanjot Kaur from Baba Karan Das School stood second and third, respectively. Managing Director of the school Davinder Kaur Chinna said the technical experts from the energy conservation wing of the Power Corp educated schoolchildren on the various ways to conserve energy at their homes. She added that students from 10 schools participated in the contest.